Designing a landscape can be distilled into a core concept: creating a series of outdoor rooms within a larger environmental context. A room may be a quiet retreat for reading or sketching, or a lively space to gather and socialize with good company. Whatever the function, it is clear people are enjoying a variety of activities in their outdoor spaces. And what better way to enjoy your open air activities than with food and drink in hand. Grilling skewers. Smoking meats. Baking pizzas. Mixing cocktails. When you are able to prepare fine foods and refreshments, the outdoor kitchen becomes a node for entertainment and enjoyment. 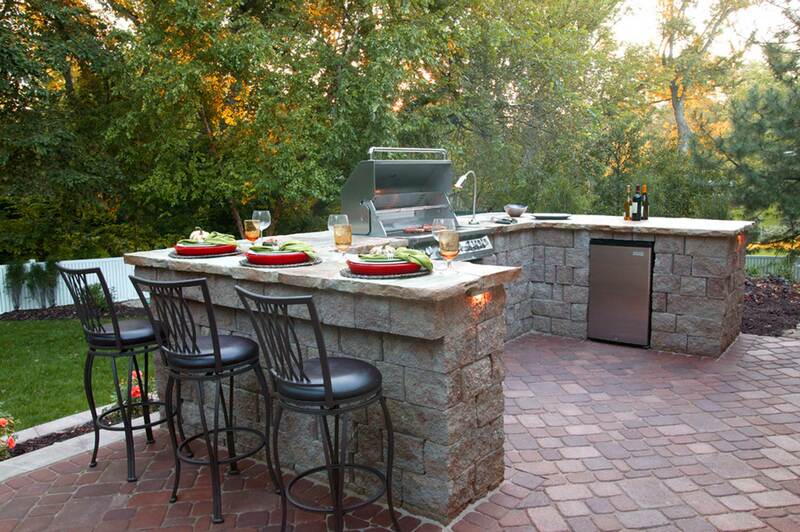 Designing the outdoor kitchen for your needs is essential to create a great atmosphere for your outdoor space. 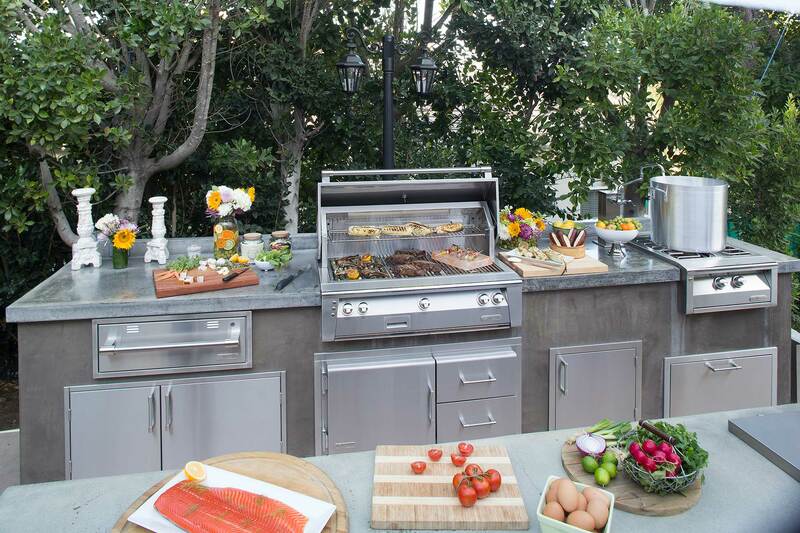 It’s important to think of all aspects that influence the outdoor kitchen, going beyond what is cooked and served. The design should account for a range of guests, generous seating, fluid circulation and appropriate spatial arrangements for ease of cooking. These are all aspects best designed by a professional. 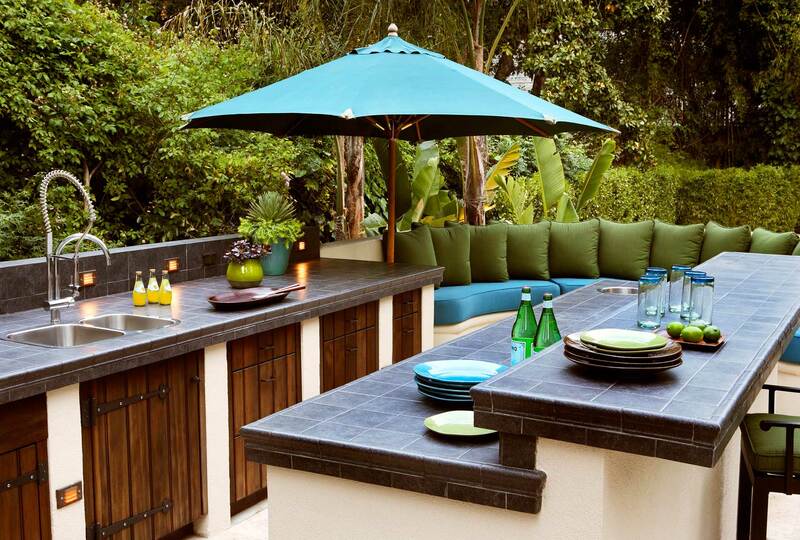 Landscape architects study and explore the best ways to incorporate an outdoor kitchen into the overall landscape design, all while meeting each client’s aesthetic and functional preferences. The resulting outdoor kitchen design will be a comfortable outdoor space that is cohesive and appropriate for the surrounding landscape, as well as suitable to the architectural character. At Terra Ferma Landscapes, we work with your needs to come up with a design fitting your unique outdoor space. It’s important to first consider your layout and how it responds to the context of your landscape. With the layout confirmed, programming the space with appliances follows. 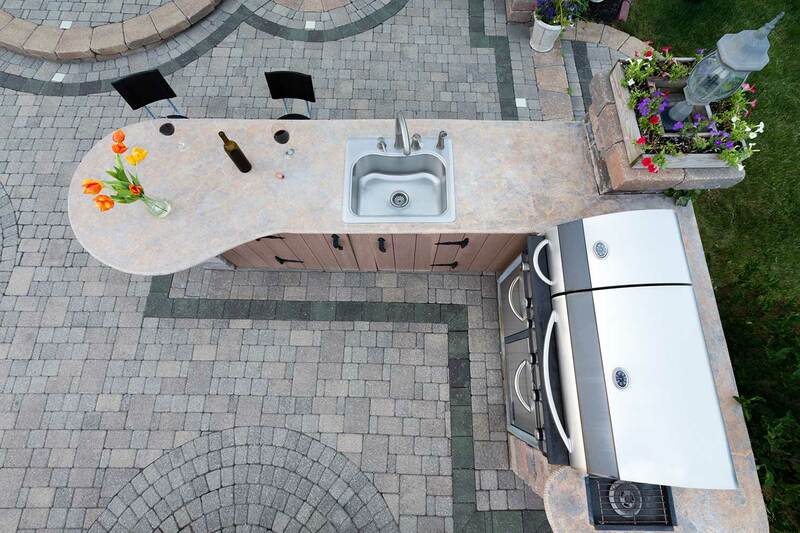 Outdoor kitchens come in all shapes and sizes. They can range from simply having counter space and a grill, to being fully equipped with drawers, cabinets, and coolers. Customizing your kitchen begins with your layout and how you envision using the space. L-shaped kitchens allow you to have more countertop space adjacent to the grill. U-shaped kitchen layouts work well as a destination for guests to gather around. Galley layouts are simple and small in footprint, and work well with island configurations. Each landscape, however, is unique with varying site conditions. We are able to take this into account and produce a layout fitting for your overall design and property. Now with the layout configured, it’s time to consider what elements to include. With cooking being the primary use of the kitchen, is easy to forget other essential functions important to a kitchen. For example, prepping your food and cleaning up are functions that round out the full kitchen experience. Having generous countertop space will make food preparation comfortable and convenient, as well as provide space for setting out serving dishes. Having a built-in trash receptacle will provide a discreet solution for disposing food scraps, and will keep the outdoor kitchen orderly. 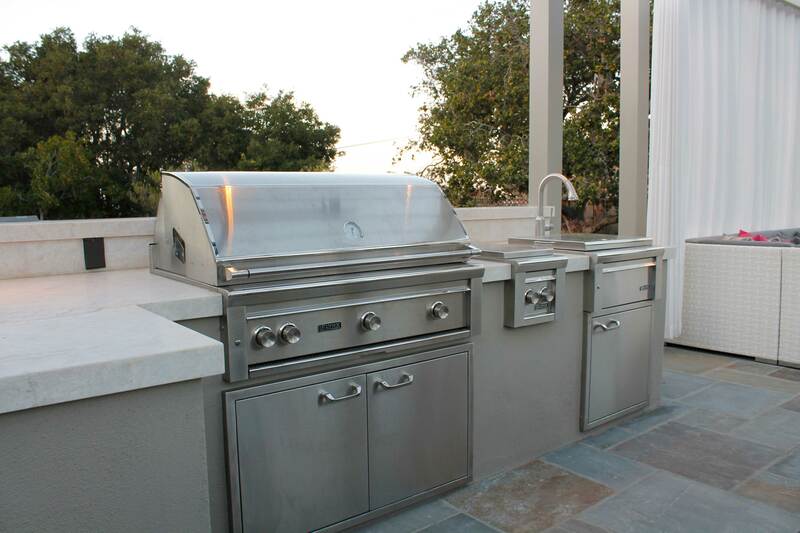 Many suppliers offer specialty appliances to further customize your outdoor kitchen. 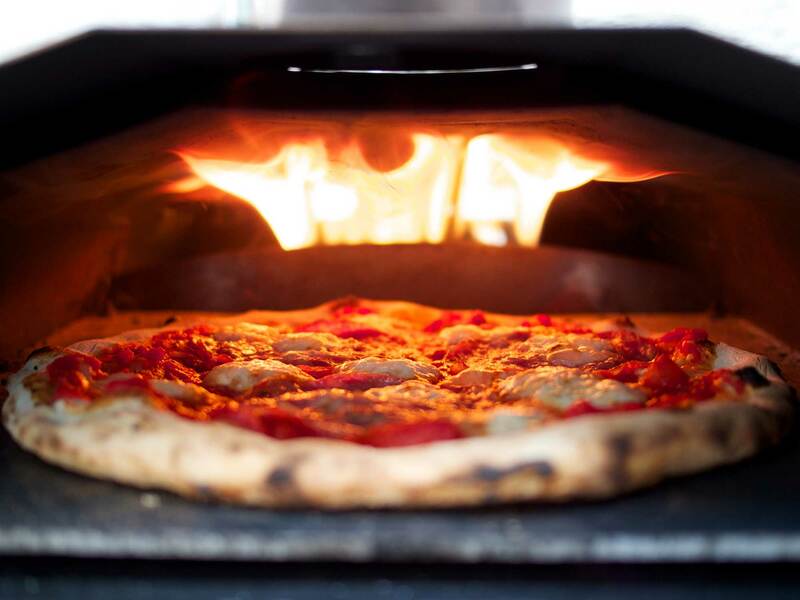 For a kid friendly cooking option, consider adding a pizza oven. The pizza can be prepped, baked, and served all in the comfort of the outdoor environment. Brands such as Alfresco Outdoor Culinary Systems and Kalamazoo Outdoor Gourmet offer quality pizza ovens within their product line. If you frequently host gatherings, then you know keeping your food warm and drinks cold are essential once your guests get settled. 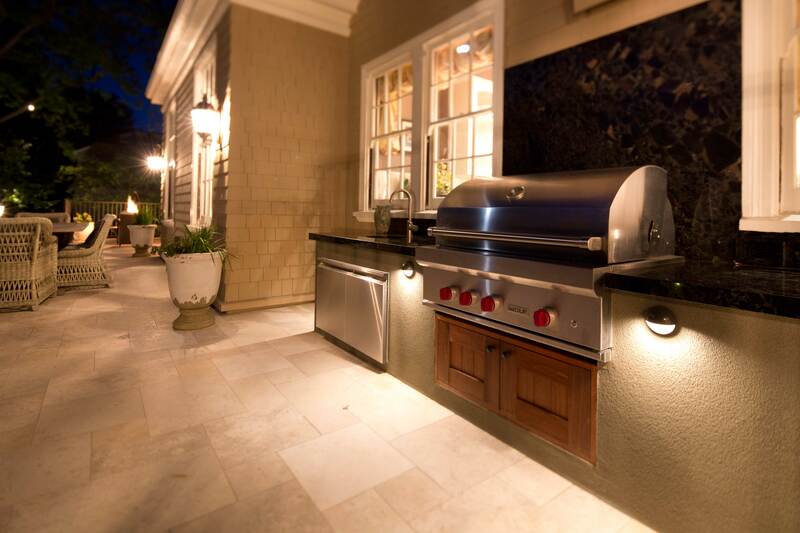 To help keep the party going, consider refrigerating and warming units for your outdoor kitchen. They are smart, convenient options that let you entertain larger groups for longer periods of time. 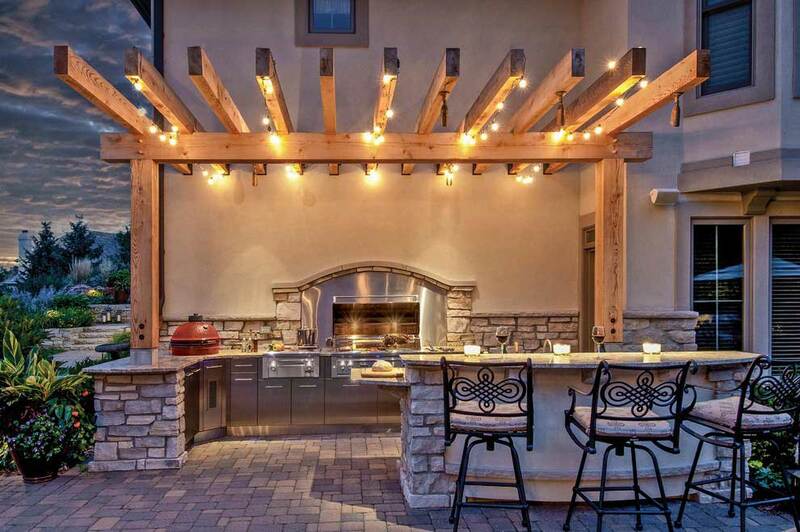 Designing an outdoor kitchen space can be a huge undertaking, but appropriate guidance and an understanding of your space will yield clever solutions. The Terra Ferma Landscapes Team fosters healthy and open dialogue to ensure your outdoor kitchen design caters to your needs and fits with your landscape.